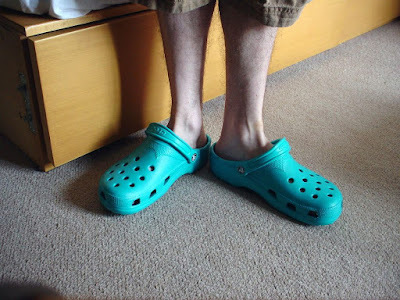 This contrafactum is to go over the pros and cons of wearing the durable foam clog footwear known as "Crocs." A montage of pictures and possibly videos of crocs and them being worn are to be shown in the music vid. After budgets improve, hire professional dancers to dance to the tune of this contrafactum while they wear different sorts of Crocs. Labels: boating shoes, croc, crocs, fashion, foam clog, footwear, parody music, shoes, Son of W.A.Y.